Because Australia is so far from North America, it’s not the sort of place you can conveniently go for a long weekend. Even if you could, it wouldn’t be advisable: there is simply so much to see and do there that you’ll need more time than you have, no matter how much that is. When we planned a visit in 1995, I was determined to pack as many sights as possible into the two weeks we had. Sydney was a must, we knew… and Melbourne… and the Great Barrier Reef, of course… and the Outback. Even with a hurry-up-let’s-go schedule, we were only able to sample a small portion of Autralia’s unique charms. What follows is a portion of one day there, as noted in my travel journal. I should mention that we began the day in the city of Cairns — the staging area, so to speak, for visits to the Great Barrier Reef. 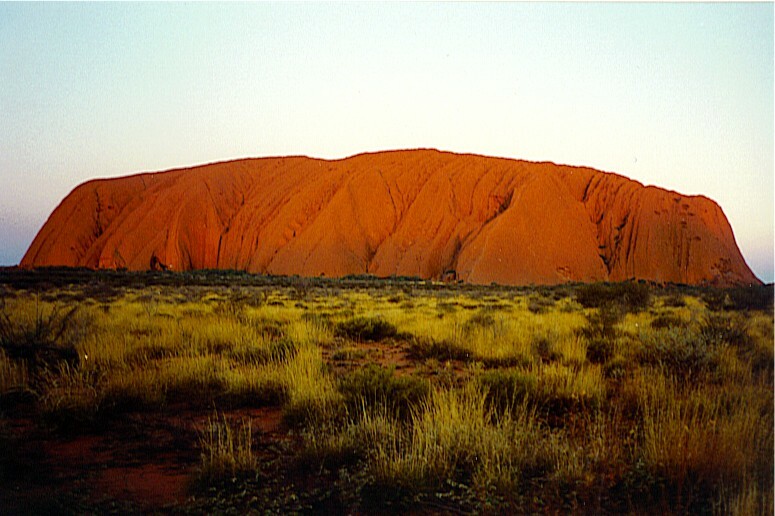 We had been there for a couple of days, and now I had us headed into the Outback for a visit to Uluru, also known as Ayers Rock. Located in the center of the continent, it is an enormous red monolith that rises from a flat plain extending many miles in every direction. …Our flight to Ayers Rock was via Alice Springs. On the way, the man who was sitting next to Sally defiled Scotch by mixing it with (shudder) Coke. In the Alice Springs airport, a gift shop employee occasionally gave performances on the digiridoo. It’s a small enough airport that it was filled with the droning sound of that Aboriginal instrument. At one point I had to go to the counter and say, “Excuse me, but because of the digiridoo, I couldn’t quite hear that last announcement.” First time that’s ever come up. The flight from Alice Springs to Ayers Rock takes 37 minutes, and the flight attendants must set some sort of speed record. They managed to distribute sandwiches and fruit and beverages on a 37 minute flight. We checked into the Sails In The Desert Hotel, which is part of a group known collectively as The Ayers Rock Resort. We made arrangements for a taxi service to take us on a sunset drive around Ayers Rock. The driver picked us up at 5:00, along with several other travelers. Seen from a distance, Uluru (as the locals call it) reminded me of the back of an enormous whale emerging from a flat sea. The rock is the only thing that breaks the horizontal plane of the plain for many miles around. We made a circuit of the rock, stopping once or twice for photos. Whenever any of us got out of the van, we were swarmed by small black flies, who particularly seemed to be interested in the mucous membranes of our eyes, noses, and mouths. The driver has apparently gotten used to them, but the rest of us found them quite annoying. Swiping your hand in front of your face to shoo away the flies is known as The Ayers Rock Salute.